Dozens of people joined queues at a polling station in the capital Freetown as early as 3 am, four hours before the vote kicked off, amid frustration with the two parties that have alternated since independence. “I’m going to share my vote,” said Harolda Forbes, 27, before casting her ballot for ruling party candidate Samura Kamara as president but the opposition’s lineup for parliament in a country still recovering from a horrific 1991-2002 civil war. President Ernest Bai Koroma, who cannot run again after consecutive five-year terms, has anointed Kamara as his successor for the ruling All Peoples Party (APC). “(Kamara) will come and do something good. There will be a change in our country,” said Forbes, who is unemployed, while adding that she appreciated the work of the opposition Sierra Leone People’s Party (SLPP) in her local community. The export-dependent economy of the mineral-rich but impoverished country is in a dire state following the 2014-16 Ebola crisis and a commodity price slump that drove away foreign investors. More than 3.1 million voters are registered for the polls, which were set to close at 6 pm (1800 GMT)with partial tallies expected within 48 hours and complete results within two weeks. The SLPP has retained the same candidate, Julius Maada Bio, who lost to Koroma in 2012. 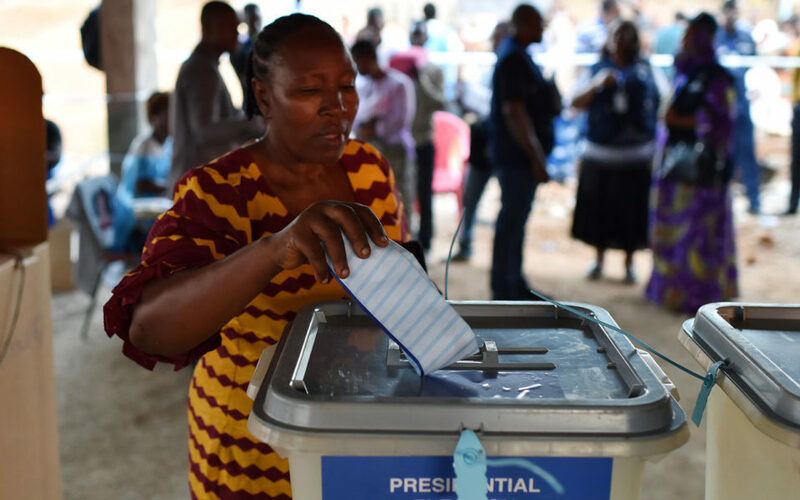 The National Grand Coalition (NGC), headed by former UN diplomat Kandeh Yumkella, is challenging the two-party system by appealing to young and better educated urban voters who are less likely to vote along regional and ethnic lines. Sierra Leone is sharply divided along regional lines that overlap with ethnicity. The APC broadly relies on the Temne and Limba people in its northern strongholds, while the SLPP is more popular in the south with the Mende ethnic group. “They have huge resources compared to us but we have connected to the people better,” Spencer said. Observers from the African Union, Economic Community of West African States (ECOWAS), the European Union and the British Commonwealth are all overseeing voting. Some fear a lack of transport to polling stations in rural areas, as Sierra Leone’s high court this week upheld a ban on private vehicles circulating on election day, citing national security concerns. The SLPP has refused to sign a memorandum agreeing to the move, saying it could disenfranchise voters, but Bio told crowds at a final rally on Monday he was “ready for a peaceful election”. The issue of corruption has dominated the campaign, as Bio is accused of stealing $18 million while heading a junta government in 1996 and Kamara is nicknamed “Mr 10 percent” for allegedly skimming his own fee off government contracts. Meanwhile, outgoing president Koroma’s increasing reliance on China for infrastructure, including a new airport and adjoining toll road, have raised concerns that Beijing is seeking to keep the APC in power. “Chinese companies and political officials have bled into the current electoral cycle, shaping public discourse, as well as long-term economic and political decisions,” noted the IGR report.